Robert James is the third generation of watch and clockmakers. His late Grandfather James, Father Beau and Uncle Rex were all leading watch and clockmakers. In fact Beau and Rex having given up their own shops in Birmingham, worked in their later life as part of Robert’s team.Robert began to learn his skills when he was a young boy still at school, working in his Father’s shop on Saturday’s. Having developed a natural practical flair, he attended what was then Birmingham Polytechnic to learn more theory. Robert is a fully fledged member of the British Horologial Institute. After working for his Father for seven years he then went elsewhere to obtain further experience in the trade of watchmaking and jewellery. 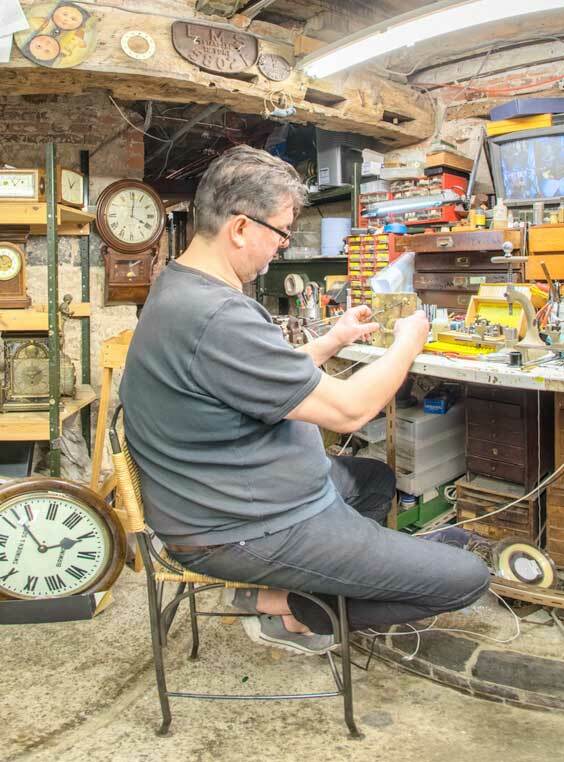 He settled in the village of Tutbury in 1989 and from then on used his expertise to build up what has been described as the best clock, watch and barometer repair shop in the area. He subsequently opened up another branch in Ashbourne and after about 25 years, due to a shortage of sufficiently skilled horologists has now closed Tutbury and moved all business across to Ashbourne, where he has also opened a small friendly licensed cafe. He has been featured on Central News, Under the Hammer and local radio stations and is often invited to write articles on his subject for magazines. R A James offer a complete restoration service to movements, cases and dials for watches, clocks, barometers and music boxes. All disciplines are executed by highly trained specialists in their individual field. These include clockmaking, watchmaking, cabinet making, french polishing, dial painting, silvering and enamelling, silversmithing, gilding, glass work and bevelling and all aspects of barometer repairs. Services and repairs are backed up with a guarantee unless otherwise stated.